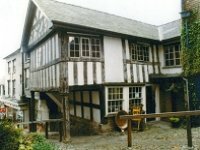 Bishop's Castle Heritage Resource Centre has close links with the two museums in Bishop's Castle. It was the volunteers within the House on Crutches Museum Trust who instigated the project leading to the development of BCHRC in 2003. Both museums are run by volunteer effort, and are open to the public from 2pm to 5pm at weekends and bank holidays throughout the summer months. The House on Crutches Museum’s reserve collection is stored at Bishop's Castle Heritage Resource Centre, and access to items in the collection is available for researchers. In addition, you can search the collection online.